The Strobe Yo combined Yomega's patented plastic transaxle system with a patented electronic pulsating diode inside the hollow body each halve. The body was essentially a modified Yomega Fireball/Raider. 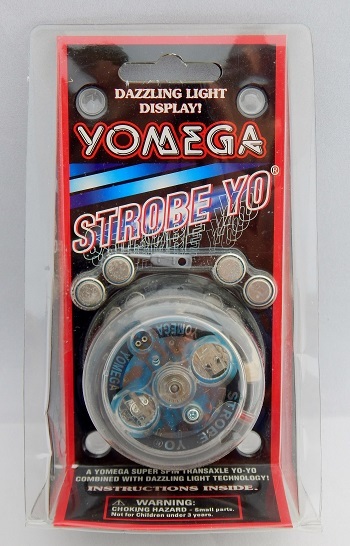 At the time of its release, Yomega touted the Strobe Yo as the most advanced, "Strobe-Yo-Scopic" light-up yo-yo on the market. The light effect was activated only when the yo-yo was spinning. Compare with the Yomega Hyper Mirage and the worlds first and only Class 3A Laser Yo-Yo that also glowed in the dark! Holds U.S. patents 4,895,547 (23 January 1990, assigned to Leonard R. Amaral for a Superior performance yo-yo) and 5,145,444 (8 September 1992, assigned to Jack C. VanKuiken for a Strobe light effect yo-yo). Yomega eventually replaced the Strobe Yo with other updated versions that included the Lightbeam and Lightbeam Wing, and the Spectrum.